I know it has been quite some time since I have posted… Heck, it’s been a long time since I have written anything. Originally, Cupid’s Eros was to be a love blog of sorts. Not love advice, but a chronicle of the journey, my journey, to love. I’m not sure if people understood this, but all my stories on Cupid’s Eros were past events. I was in a relationship when I started the blog and wanting to find humor in every situation, thought it would be fun to recount the tales of all the awkward dates, poor choices, and straight-up weirdness that led me to my present (but now past) situation. Well, things did not quite turn out as I had hoped and as I never felt quite comfortable writing about present-day life matters, the writing came to a halt. Out of respect for myself and my dates, I could not bring myself to blab about my current (and again, now past) dating adventures. So Cupid’s Eros sat and collected dust… kind of like my love life. Eerie. I’ll be honest though, you didn’t miss much. I putted through dates like a game of half-hearted mini golf. Everyone encouraged me to get back out There, and I still have not found just where this mythical There is. But, my pursuit of the Land of There lead me to sitting in a bar, on a date with this man who scratched his balls at the rate a human baby blinks. These were not minor adjustments… he was scratching with a deep digging vigor one does when trying to get pasta sauce out of one’s brand new cream-colored carpet. First and last date. Another time, I found myself sitting across the table from a man who let the check sit on the table for eons while bouncing his eyes from me, to the check, to his watch, and back to me. Only when I gestured to pick up the tab, does he say, “I’ll treat you. I normally don’t do this. I’m not going to go gaga over you, I know better.” Oh really, dude? First and last date. Each date was more lackluster than the previous which ultimately lead me to dating someone I had known for years, but never paid very much attention to… myself. I took myself on vacation, twice, to places I had forever longed to see. I started to learn more about who I am, how I am, and what made me attractive in my own right. I learned that I am as fearless as I am chicken. As agile as I am clumsy. As “fantastically romantic”, as one friend called me, as I am a total goofball. In the past, I had never actively sought out a partner. I went about my normal life and if I happened to meet someone I wanted to be with and who felt the same about me, we got together. I was forcing myself to go on dates, forcing myself to find someone I liked and ended up not liking anyone, at times, not even myself. My turning my love and attention inward had led me to live again as my most authentic self. So what does this have to do with Cupid’s Eros? For starters, no more date stories. Yeah, I know. **Tragic. But, I will be sharing my travel stories and general ideas and thoughts on growing into my mid-twenties. It will be a potpourri, little bits and pieces that contribute to a whole, lovely sweet-smelling experience. When I finally get my dSLR (I’ve been dreaming of the Canon T2i for some time), I’ll share my photography. For now, you’ll have to settle for a photo I took while in San Juan, on my first solo vacation, this October. It was my first day in Puerto Rico and I was still in New York City mode. I hurried down the street like a mall speedwalker. I wasn’t making eye contact with anyone and mumbled a rushed Buenas to those who passed, until I saw this Stop sign. 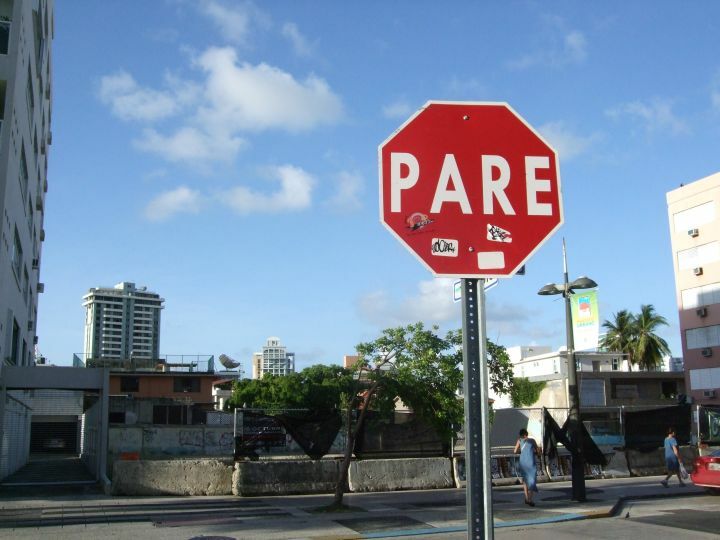 It had dawned on me that I had never seen a Stop sign in a language other than English, so I took a photo of it. Standing in the middle of the street, adjusting my camera settings, I had finally stopped. I heard the Coquis, the waves, and stopped worrying that I looked like the ultimate tourist taking a picture of a traffic sign. On the walk back to the hotel, I took my time and enjoyed the streets and residents of Condado, greeting and returning a genuine greeting of Buenas. **said in my most sarcastic voice.